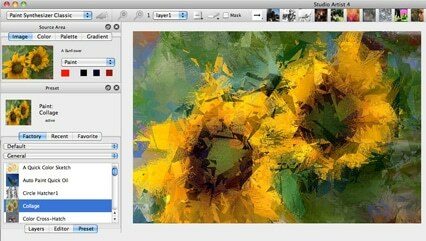 Studio Artist’s paint synthesizer is an amazingly versatile digital painting tool. You can choose to paint manually or just press the action button and let Studio Artist paint your source image automatically. There are thousands of factory paint presets available to help you get started. Paint presets are completely editable, so it’s easy to customize them to suit the needs of your own individual workflow and visual aesthetic. This tutorial will focus on getting started painting using the paint synthesizer. 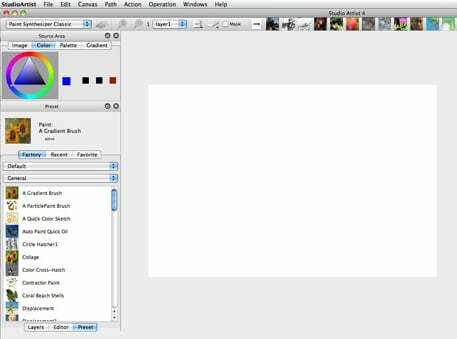 Studio Artist lets you work off of a source image or start from scratch when building up a digital painting. For beginning users, working with a source image is the best way to get a feel for how Studio Artist works. To get started, double click on the Studio Artist application icon. When the Studio Artist interface first launches it will be in the Paint Synthesizer operation mode. The Preset browser will display a series of factory paint presets. 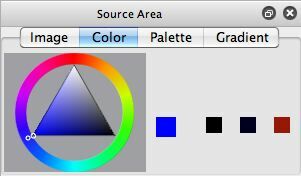 The Source Area initially starts up with the Fixed Color option, displaying a color picker you can use to choose the current source color you want to paint with. 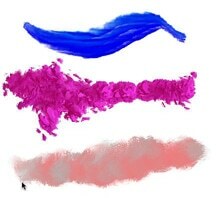 Using your mouse or pressure sensitive pen, try painting a few quick paint strokes in the canvas. By clicking on different presets in the preset browser you can load them as the current preset. Each preset has a different appearance and characteristic behavior when drawing. Studio Artist’s paint synthesizer is able to intelligently analyze a source image and then use that visual analysis to intelligently paint the source image in a variety of different styles. The visual characteristics of the loaded source image can also influence the appearance and behavior of paint presets designed for manual drawing as well. So you should try painting with a loaded source image to really appreciate the full potential that the factory paint presets have to offer. Now lets get started by loading a source image. 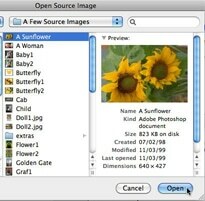 Use the File : Open Source menu command to open a source image. If you are just getting started there are some source images that come with Studio Artist you can use for your first introductory painting sessions. When you run the Open Source menu command a standard file dialog will come up. Try going to the A Few Source Images folder that is in the same folder as the Studio Artist application. Choose the A Sunflower image to get started. After you select your source image the Source Area will change to the Image tab and you will see a small representation of the source image you selected displayed in the source area. Now try painting a few paint strokes. Note that the coloring of your paint strokes is now being chosen automatically from your source image. The color that is selected depends on where you are drawing in the canvas and is chosen to match the color of your source image in an equivalent spatial location. The source image will automatically map to the full canvas dimensions, even if they are different sizes. Some paint presets will drag their initial coloring for the length of the entire paint stroke. Other presets may clone color, which means that the coloring of the paint stroke will adjust as you move the pen while drawing to best reflect the associated source coloring. Studio Artist can intelligently paint a source image or a complete video file in a variety of different visual paint styles with no assistance from a user. This is called auto-painting, or auto-rotoscoping when working with movie files. Studio Artist uses the results of it’s intelligent visual analysis of the source image or source movie file to control drawing behind the scenes. If you are just getting started with digital painting then Studio Artist’s intelligent assisted drawing will really open up new creative doors for you by enabling you to quickly be able to create artistic pieces without having to spend years learning to draw. Even if you are comfortable working with traditional manual painting you will find that automatic painting is an amazing source of creative inspiration, and a useful new tool for building artistic effects. And no matter what your background is, auto-painting is just plain fun. Now, lets try automatic painting. Press the Action button. Watch how Studio Artist automatically paints in the source image. To stop automatic painting, just press the spacebar. Each paint preset has a different automatic drawing behavior in addition to the different physical appearance of the paint. 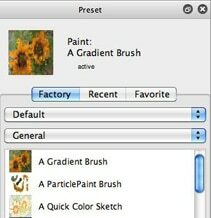 Try selecting different paint presets and then use the Action button to see how they automatically paint. Studio Artist presets are hierarchically organized by Collection And Category. There are 2 popup controls at the top of the factory preset browser that you can use to choose different collections of presets and the different categories associated with each collection. Every time you load a new preset category the list of presets in the factory preset browser changes to display the individual presets included in that category. Studio Artist ships with thousands of different factory presets. They encompass a vast range of different artistic effects. Rather than restrict your creative options to a few generic art presets we try to offer a very wide range of different aesthetic choices. Some presets try to emulate traditional art media or techniques. Others create never seen before digital paint effects. All of the factory presets are completely editable, so you can modify and tweak them if desired to suit your own artistic needs.By editing your own presets, and building your own preset collections and categories you can totally customize Studio Artist to your own personal artistic vision. Spend some time exploring the different factory paint presets that ship with Studio Artist. Some presets may have been designed primarily for auto painting or for manual painting, so it’s worth both manually painting a few paint strokes and then pressing the action button and watching the preset auto-paint to get a sense of what an individual paint preset can do. If you do a lot of manual hand painting the CD_hand_Drawn_media collection was specifically designed for manual painting as opposed to action painting. The source area determines how coloring is applied to paint strokes. Depending on how you adjust the source area controls you can dramatically change the coloring behavior of your painting. Most of the main source area tab options also include a secondary coloring option you can adjust with a popup control. The Image source area tab offers the following secondary coloring options, which are all derived in some way from the source image coloring.. The paint synthesizer offers a large number of editable parameter options that can change the appearance and drawing behavior of any given paint preset. You can adjust all of the different editable paint synthesizer parameters in the Editor palette. One very useful adjustable control is the pen mode. Any given paint preset will have radically different drawing behavior based on the pen mode setting. So learning how to adjust the pen mode is a great way to start to get familiar with editing the paint synthesizer to customize how paint presets look and behave. The Pen Mode option is located in the Pen Mode control panel. There’s a tutorial tip that discusses the different pen mode options and how to adjust them here. 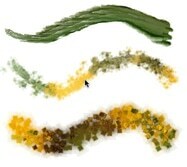 There are a large number of different editable controls available in the paint synthesizer for adjusting the look, feel and automatic drawing capabilities of a paint preset. While this extreme amount of control ultimately is extremely useful for both customization and for providing the underlying capability to produce rich,lush organic paint effects, it can be somewhat intimidating to a beginning user. Macro edits are a collection of single step editing commands that can be used to easy modify or edit paint presets. 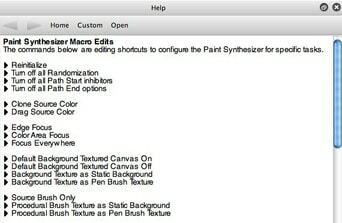 The paint synthesizer macro edits are available in the Help Browser as a series of active link commands. To edit a paint preset with a specific macro edit command, just click the black arrow icon on the left side of the command. Pressing the arrow icon will run the active link command, which will automatically edit the current paint synthesizer settings to correspond to the editing change you requested. The screen shot above shows a user running the Clone Source Color macro edit. Running this macro edit command will adjust the current paint preset so it clones color as opposed to dragging color. Many macro edits adjust a series of different internal editable parameters to make the requested editing change. You could of course do this manual editing yourself by adjusting the series of editable controls in the paint synthesizer editor. The point of the macro edits is to provide an easy single click editing interface to common editing commands as an alternative to getting under the hood of the pant synthesizer. An introductory overview to the design philosophy behind the Paint Synthesizer is available here. A short tip on how to change the brush size is available here. A short tip on how to adjust the paint opacity is available here. The Studio Artist User Guide pdf is the ultimate technical reference for all of the functionality available in Studio Artist. There’s a very detailed Paint Synthesizer chapter in the User Guide pdf that goes into great detail about all of the editable controls available in the paint synthesizer. The User Guide pdf is available in your main Studio Artist folder.